The promotional efforts have already begun in five cities in five states, updating over 350 travel agents in the Bajio region of Mexico. The Riviera Nayarit and Puerto Vallarta’s Bajio Regional Tour is on for the week of Monday, February 27 through March 3, 2017. 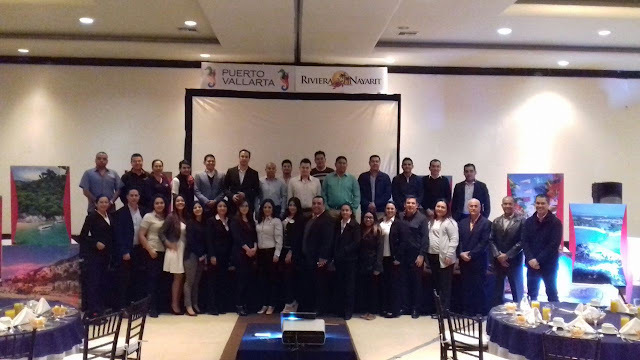 The Promotions desks of the Riviera Nayarit Convention and Visitors Bureau (CVB) and the Puerto Vallarta Tourism Board are hard at work raising the profile of the tourism product of the region. The five states included in the promotional region are included in the list of top ten places of origin for tourists headed to the Riviera Nayarit during 2016: Guanajuato in 2nd place; Aguascalientes in 4th; Michoacan in 6th; San Luis Potosi in 8th; and Queretaro is in 10th. This data was obtained from information posted by the Riviera Nayarit CVB Barometer. The Bajio Tour will be visiting the following cities on the following dates: Morelia on February 27th; Queretaro on February 28th; San Luis Potosi on March 1st; Aguascalientes on March 2nd; and Leon on March 3rd. The objective is to update over 350 travel agents; an average of five wholesalers and two airlines are usually also present at each city visited. Approximately 30 hotels from both destinations, including one from Tepic, joined the promotions team. Their presence serves to complement and strengthen the attractiveness of the area for visitors. The goal of the presentations is for travel agents to offer the Riviera Nayarit and Puerto Vallarta as the top option to vacationing clients, which is why during the presentations they’re motivated with dynamic, interactive games where they can win fun prizes.